Hays Heavy-Duty Flexplates are engineered to meet the demands of your high-performance or competition engine. Constructed of a thicker than stock plate, enabling them to withstand the stress of high-stall torque converters and today's high-RPM engines. Don't ruin your project or race season by trusting a thinner factory flexplate that's prone to cracking around the crank bolt holes and hub, the thicker Hays Flexplate handles the force. These heavy duty flexplates are supplied with a ring gear that is securely welded in place and feature dual bolt patterns for flexibility in adapting to multiple transmission style torque converters. All Hays heavy-duty flexplates are zinc-dichromate plated to resist corrosion and are ether 29.1 or 29.3 SFI certified. 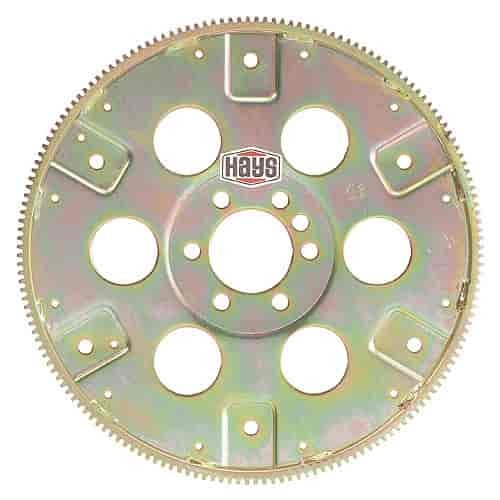 Buy a precision built Hays Heavy-Duty Flexplate for your engine's high-torque, high-RPM needs. Does Hays 10-010 fit your vehicle? 10-010 - Hays Heavy-Duty SFI Flexplates is rated 5.0 out of 5 by 1.